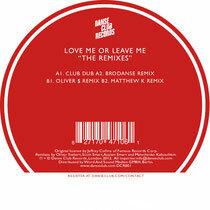 Brand new UK label, Danse Club Records launch their ‘Gold Series’ with a re-mastered and remixed version of the 1995 house classic ‘Love me Or Leave Me’ by Cherie Lee. Danse Club Records is a new label venture from brothers Scott and Austen Smart, siblings who produce together under the Brodanse name and have music forthcoming on the Fresh Meat label out of Chicago as well as the Fullbarr imprint. The Danse Club label is to focus on new house and techno releases from established and upcoming artists and alongside this will have a ‘Gold Series’ that will feature classic records from the ‘90s re-mastered and remixed by leading producers. To kick things off the Smart brothers have picked up a track from 17 years ago, Cherie Lee’s ‘Love Me Or Leave Me’, a record that appeared on New Jersey label Music Station and was produced by label boss Jeffrey Collins. The single opens with the original Club Dub, an organ led, shuffling house affair that transports one straight back to the dancefloors of the mid-90s. The first of the remixes comes courtesy of Berlin based Oliver $, a producer who has made a name for himself recordings for labels such as Jesse Rose’s Made to Play and Grand Petrol Recordings and who was responsible for Beatport’s track of the year at their awards early in 2012. Here Oliver delivers a solid, rolling rework that picks up the pace and wraps edits of Lee’s vocal around a heads down groove. Next up is label bosses Brodanse who turn out a stripped back, tech fueled mix that utilizes tight percussion, bumping bass and analogue squelches. The package is completed by Baltic born producer Matthew K who takes time out from his recording for sthlm, Kolour etc to rework the track into a piece of deep house complete with subtle melodies and edits of the original vocal. It’s out now.